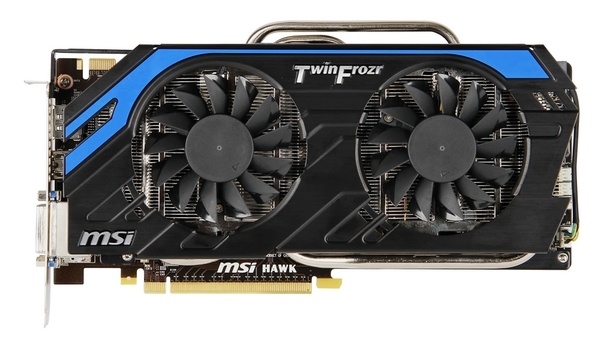 MSI has launched its GeForce GTX 660 HAWK graphics card featuring an amazing factory overclock coupled with a custom designed PCB and Twin Frozr IV cooling solution. 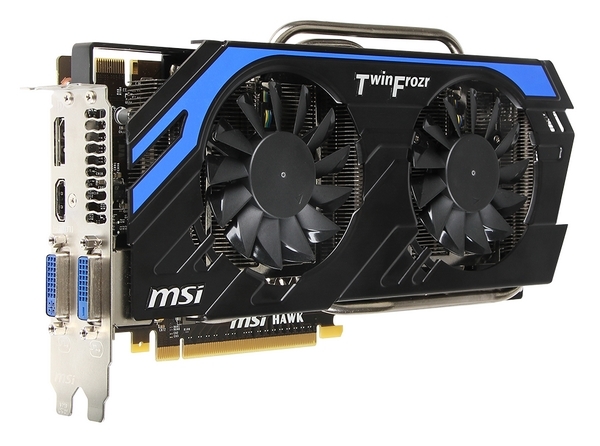 The MSI GTX 660 HAWK features a 8 +2 +1 phase digital VRM featuring golden ferrite inductor, silver aluminum core solid capacitors, Hi-C Cap and Copper MosFETs all designed to withstand the harshest overclocking environments. The GTX 660 HAWK is based on the GK106 core architecture which packs 960 Cuda’s and a 2 GB GDDR5 memory running across a 192-bit interface. The core clock is maintained at 1085 MHz and the card boosts upto 1150 MHz, memory is clocked at the reference 1502 MHz or 6008 MHz effective frequency. 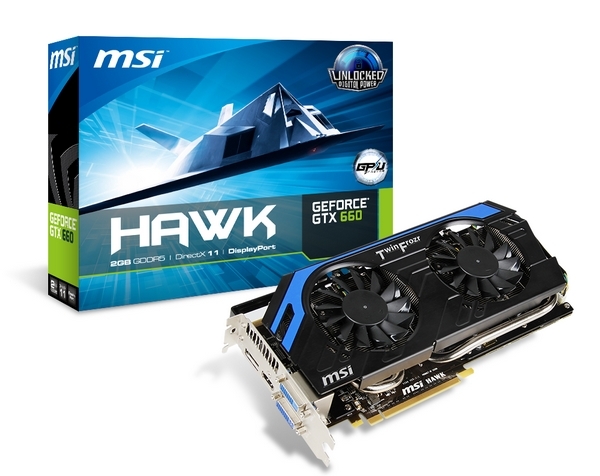 Additionally, the card can be equipped with MSI’s own GPU reactor module which can be equipped at the back adding more phases and power to the overall boards capacity further maximizing the overclocking potential of the GTX 660 HAWK. Cooling the card is MSI’s flagship Twin Frozr IV cooler which offers two 92mm PWM controlled fans directly cooling the aluminum heatsink/heatpipe array underneath it. A backplate is also included with the card, Display outputs include Dual Link DVI, HDMI and a Display port. 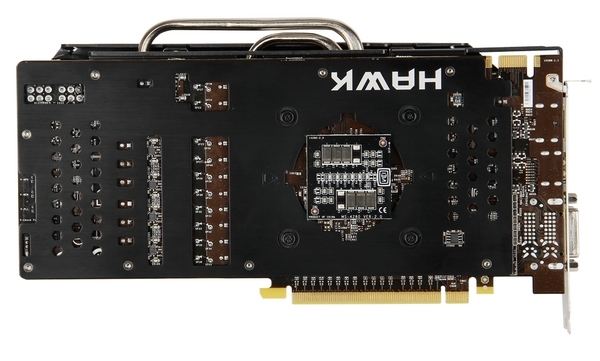 Card can be 2-Way SLI’d and is powered through dual 6 Pin PCIe connectors. 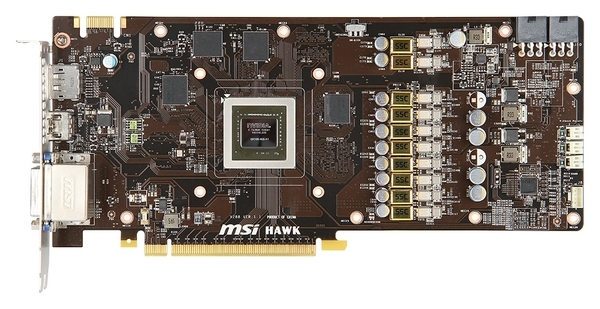 The MSI GTX 660 HAWK is ready for availability in major retail outlets and would be priced around $250 US.